Cook rice according to package directions, omiting salt. Place prawns in a bowl. Squeeze the juice of 2 limes over prawns and set aside for 5 to 10 minutes. Drain pineapple, reserving juice; place in a large bowl; set aside. Dice onion into 1/2" pieces. Press the garlic. Chop mint and basil. Grate ginger. In a frying pan heat 1 tablespoon olive oil over medium-low heat and add mushrooms, onion and 3/4 of the garlic; sauté for 3 minutes. Add prawns and chili sauce. Cook and stir until shrimp is pink. Remove from heat and stir in 1/2 cup of the mint, plus the basil and ginger. Add shrimp mixture to the pineapple. Squeeze remaining two limes over mixture; stir and set aside. To make the sauce, sauté remaining 1/4 cup mint and garlic in 1 tablespoon olive oil. Add coconut milk, chicken stock and cayenne pepper. Dissolve cornstarch in 1/2 cup reserved pineapple juice and add to sauce, stirring constantly over medium heat, until thickened. While sauce is thickening, heat peas in microwave for 3 minutes. 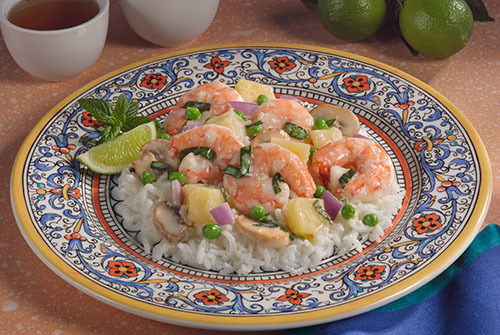 Combine sauce with shrimp and pineapple mixture and peas. Serve 3/4 cup prawn-pineapple mixture over 2/3 cup jasmine rice. Sprinkle with paprika. For a lower protein meal decrease prawns to 440g; increase to 880g for higher protein. Sriracha sauce is a hot chili sauce from Thailand. Add extra at the table if you like the dish spicy hot. Dried, crushed red chili peppers or another chilli sauce may be substitiued for Sriracha sauce. Cayenne pepper can be substituted for paprika if you like more heat.